We'll show you how to grow microgreens further below on this page, but first let's talk about what microgreens are and why they can be another option to traditional jar or vertical sprouting methods. 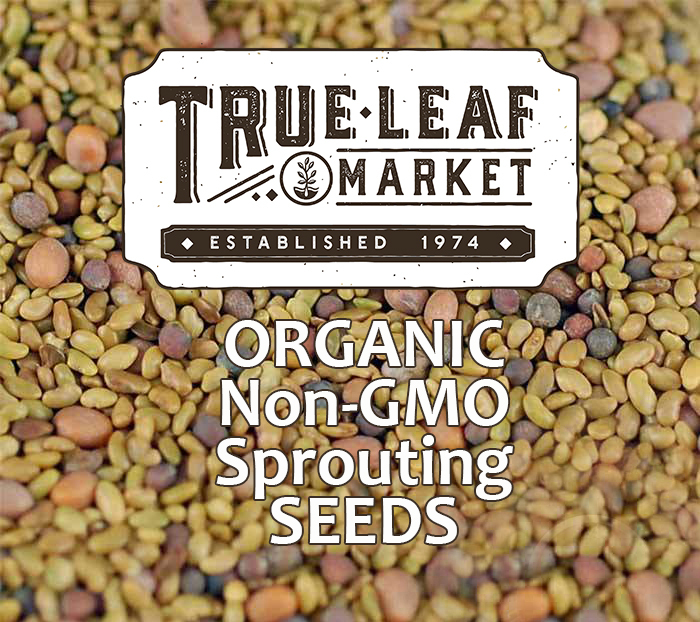 We generally place microgreens in the same category as super sprouts, but they are not really "sprouts" in the technical sense. 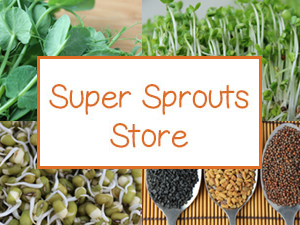 Sprouts are produced from the same vegetable and herb seeds, but are eaten in the earlier stages of growth just after the baby leaves pop out and turn green. 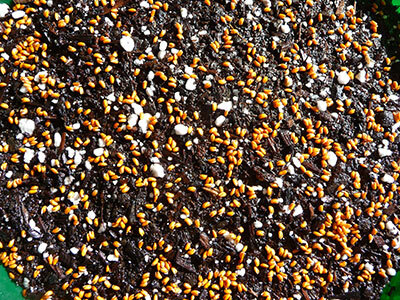 Microgreens begin their life as sprouts, but continue to mature sprouting up to two or more sets of leaves. 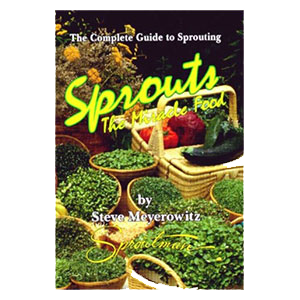 Sprouts are easier, faster and less demanding than growing microgreens, but their leaves are much smaller and thus produce less edible chlorophyll. Microgreens grow roots and become thick mini hedges that, after 2-3 weeks growing time, you can snip off and add to salads. 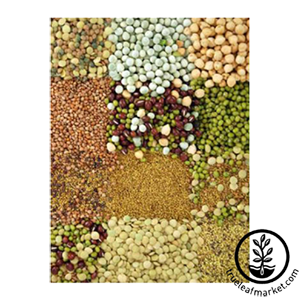 They also produce more bulk produce for the small amount of seeds you typically use. 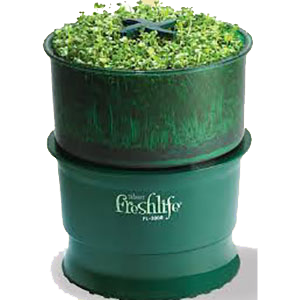 Sprouts grow on moist air while microgreens grow vertically on a soil or hydroponic medium. 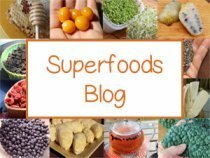 Sunflower, buckwheat and pea shoots can be considered microgreens, but technically they shouldn't be sprouted longer than 2 weeks or produce more than their first set of leaves. 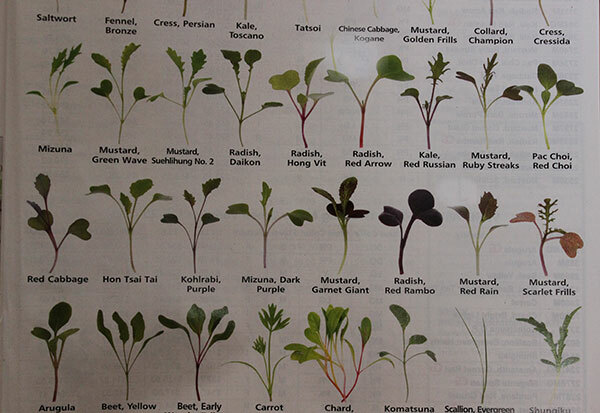 They also have larger leaves as compared to other microgreen varieties. 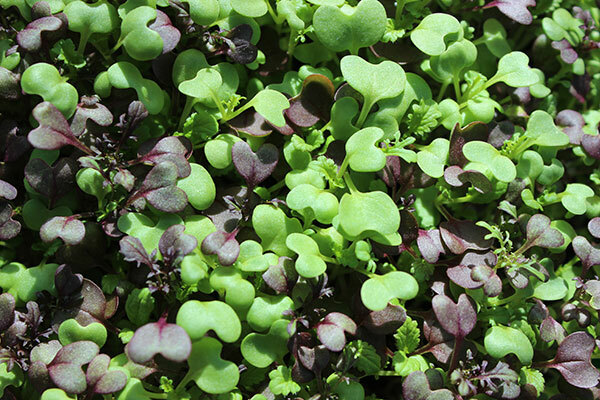 Most microgreens have small leaves and are more delicate in nature, growing between 1/2" to 3" in height. They have long white sprout stems at the bottom and two sets of leaves. 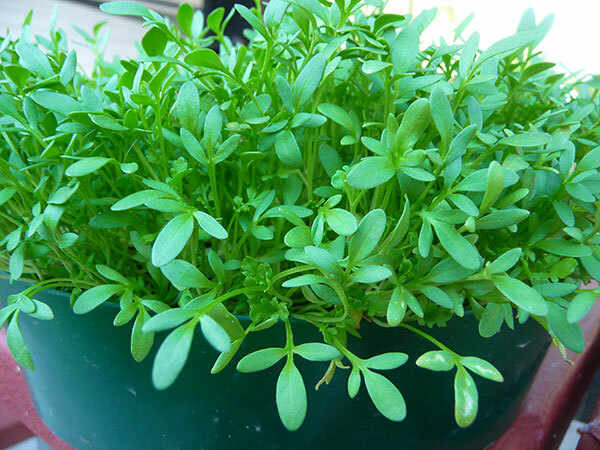 Some of you might be familiar with cress, a very common microgreen grown in the U.K. and used on the common English "cucumber sandwich." This is a good example of using sprouting seeds to grow mini green gardens that produce fresh produce right on your kitchen counter top. You can also grow some sprout varieties like broccoli, clover, mustard, alfalfa, radish, onion and others as a jar sprout or as a microgreen. Microgreens, or sometimes spelled "micro-greens", are used like sprouts as a garnish, gourmet salad green or to accent a meal or entree. They are quickly becoming the new gourmet green, described as somewhere between a sprout and a mesclun salad green. In fact, the term "microgreen" and growing greens in this way is a fairly new concept and first originated in the late 90's. The now popular mesclun greens or salad mixes sold in stores across the U.S. actually began in the 1980's. 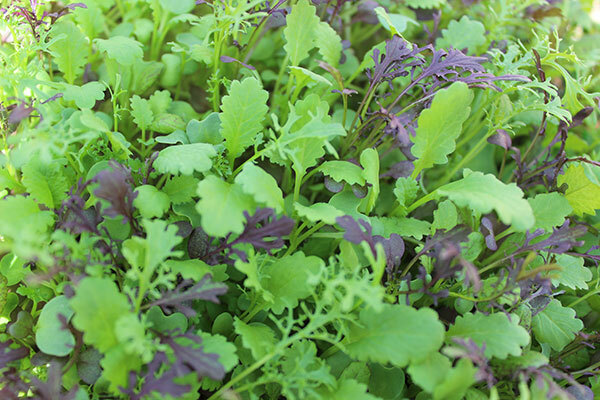 Microgreens are similar to baby mesclun greens in that you grow the leaf in a short amount of time to produce a tender texture and unique young flavor compared to that of a mature lettuce plant. Here is are our general "how to grow microgreens" guideline for indoor and/or outdoor tray gardening, depending on the season and growing location. 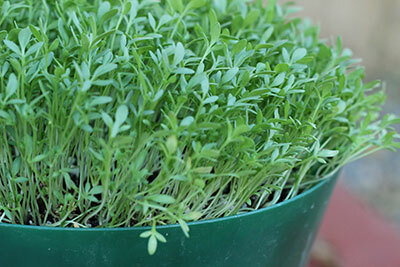 The first step in learning how to grow microgreens is to find the best container for your needs and budget. 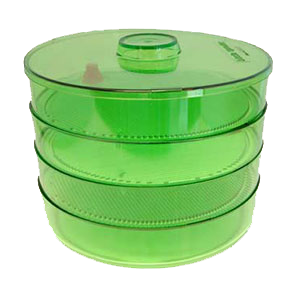 Some of you might want to save any used plastic salad mix containers so you don't have to buy one. 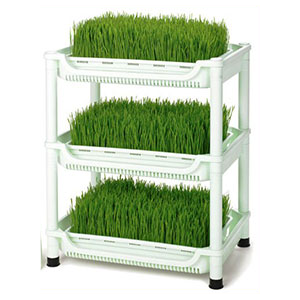 Others might want to purchase one of those 2o" x 1o", thick, black plastic trays, commonly used to grow wheatgrass. 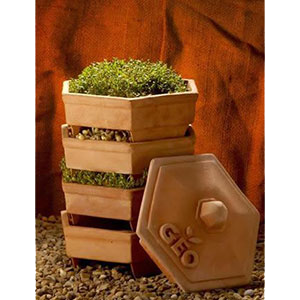 They are a bit more heavy duty and can be purchased online or at a nursery or garden store. 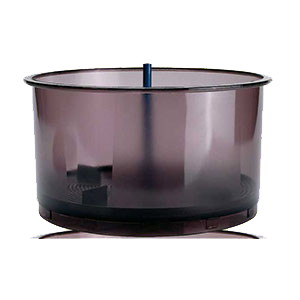 Your tray will also need a dark lid that blocks out the light during the germination process. 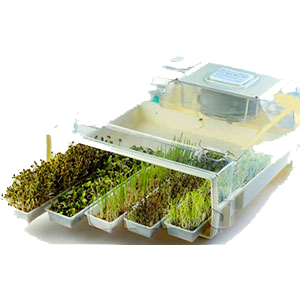 The stackable sprouters are designed to take up less counter space when you initially germinate the seeds with the lid on. 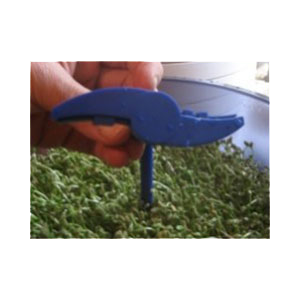 With these sprouters you can start up to five trays at a time, depending on the model. 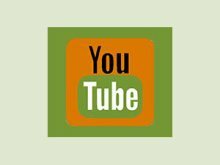 You can grow your microgreens hydroponically, but for this page we will we only discuss soil grown methods for those new to sprouting. It is less complicated and easier to learn. 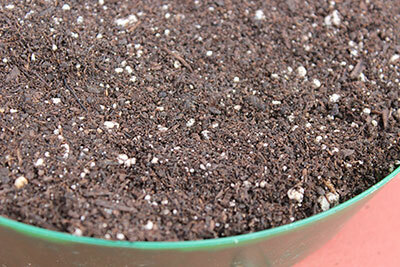 We like to grow our micro's on homemade soil compost or high quality organic soil mixed with 10-20% worm compost. 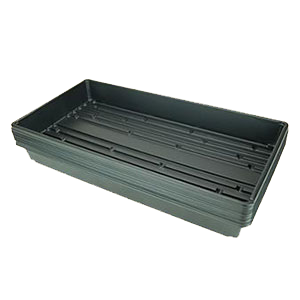 Make sure to fill up your trays to the very top of the container or sprouting tray. As you water, the soil medium will shrink down somewhat so it is good to start out with a full tray. 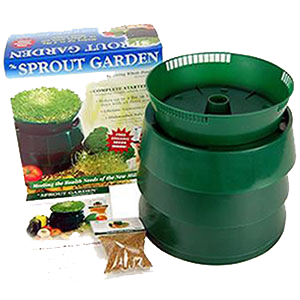 When you purchase bulk sprouting seeds it is always beneficial to go with a company that sells seed exclusively for growing microgreens or sprouts. This ensures their viability and quality. 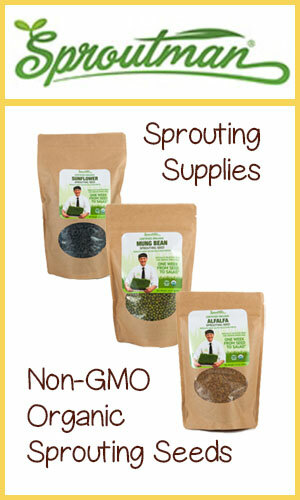 We always recommend using organic, non-GMO and non-irritated seeds that will help to produce healthy vibrant sprouts. Learning how to grow microgreens employs a different seed planting technique similar to growing sunflower greens. This involves taking a few teaspoons worth of seeds and scattering them sparingly some ¼” apart on average over the TOP of your soil medium. Before spreading your seeds make sure to moisten the soil first and then lightly mist the seeds after you scatter them over the surface. 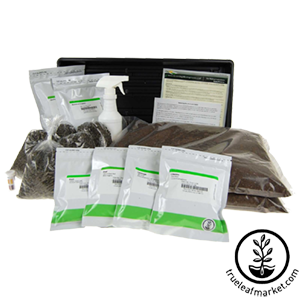 As we mentioned, the first watering involves using a spray bottle or mister to mist your soil medium well before you place the seeds on top. Continue lightly misting daily after the seeds are scattered and until the sprouts fully open their first set of leaves. At this point you remove the lid and now will be either watering at the level of the soil or, if you have holes in the bottom of the tray, can soak it in a sink or tray of water. The most important thing to remember when learning how to grow microgreens is to never use overhead watering techniques except with a fine mister, or leave them out in the rain. This will damage and most likely flatten them and they will have a hard time recovering. When learning how to grow microgreens that are green and packed with chlorophyll you must expose them to some kind of full spectrum lighting. It is always best to use direct sunlight when "greening" your microgreens, but this depends on the time of year and amount of sun available. 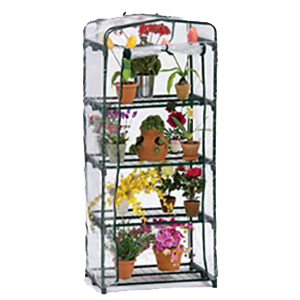 In the summer you can leave them outside 24/7, but for cooler night time temp's you'll want to bring them indoors. Some micro's can handle more direct sunlight than others so also keep this in mind when placing them in hot sun for more than 2 hours. The greening process is done after the lid is removed from the sprouting tray. This is what grows your leaves, so the more light the bigger your greens will be at the end. At this point, you will be growing your greens in as much light as possible throughout the day and watering them everyday. 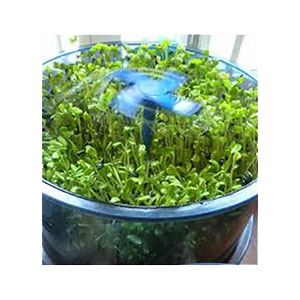 To grow microgreens indoors you will need to place them near a sunlit window or provide some kind of artificial full spectrum lighting or "grow lights" if you live in a cloudy climate. 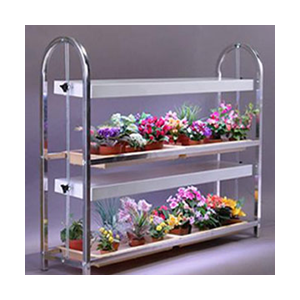 You also might want to purchase a lighted 2 or 4 tier shelf growing stand or a compact mini green house stand that are specifically designed for sprouting trays of greens. Appropriate lighting is an important thing to consider before you commit to starting any microgreen mini-garden. Many times a kitchen window sill is the perfect place to grow microgreens indoors. One of the best things about growing your greens this way is that you can move them around to areas that get more or less light. This is not something you can do when growing produce in the ground. 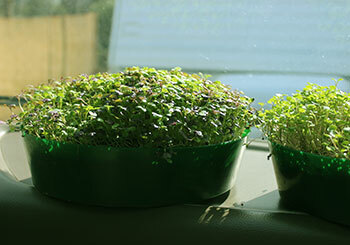 We have even traveled with micro-greens sprouting on the dashboard of our vehicle. One of the secrets when learning how to grow microgreens successfully is providing them with plenty of warmth. Some micro-greens, like basil, won't even grow in temp's below 75-80 degrees F and other "winter vegetables" like kale or broccoli don't seem to mind cooler temp's. 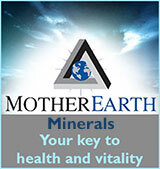 Most micro's like warmer conditions and respond accordingly by growing at a much faster rate. 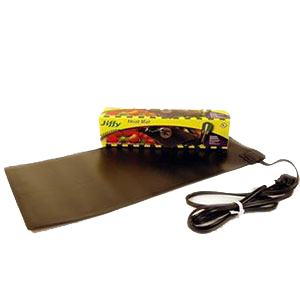 For colder temperatures you can buy an electric grow mat that can be placed under the tray for additional heat. 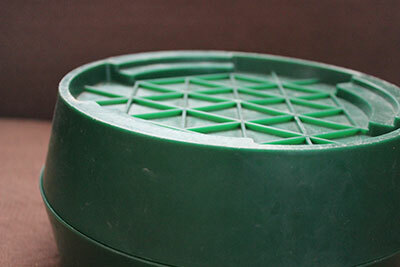 Another option is an enclosed plastic green house that can hold up to four 2o" x 1o" trays of greens. 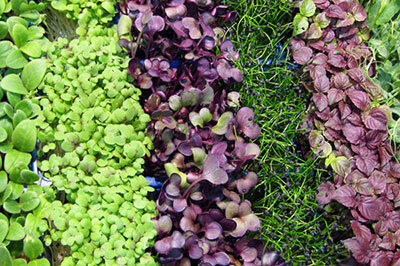 Most microgreens can be harvested after the second leaves emerge and get sizable. It is always good to taste test to make sure the particular variety you are growing is ready to be picked and eaten. This is usually pretty obvious visually because you have a full hedge of beautiful greens that are dense and tightly packed. Some greens are more tall and slender while others have bigger leaves and tend to grow closer to the soil. To harvest them you need to get out your kitchen scissors and snip a bunch of greens at the base as close as you can to the soil. You can enjoy them fresh, immediately transferring them over to your salad bowl or they can also be stored in the fridge. We usually keep them in a plastic bag or sealed container of some kind so they will last for several days, just like lettuce or other green leafy vegetables. When you are first learning how to grow microgreens you might feel overwhelmed when you realize the potential and assortment of seeds and greens you can actually grow this way. We recommend starting out simple with a few basic easy to grow varieties and then eventually expanding by combining and blending your own seeds. Amaranth, Garnet Red - Mild flavor. Attractive fuchsia stems and leaves. Arugula - Spicy arugula flavor. Purple stems and dark green leaves. Basil, Dark Opal - Basil flavor. Mostly purple but some green leaves. Beet, Bulls Blood - Mild beet flavor. Deep burgundy leaves. Broccoli - Nutty and slightly spicy. Buckwheat - Mild, lettuce-like flavor. Cabbage, Red - Mild flavor. Dark green leaves with purple margins. Chinese Cabbage, Kogane- -Mildly sweet flavor. Bright green leaves. Carrot - Finely textured leaves. Mild carrot flavor. Chard, Ruby Red - Mild beet flavor. Green leaves with bright reddish pink stems. Chinese Cabbage, Kogane - Mildly sweet flavor. Bright green leaves. Cilantro - Cilantro flavor. Green, attractively-shaped leaves. 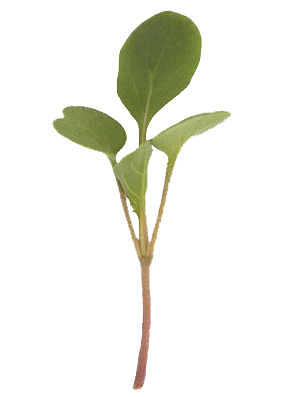 Collard - Medium green leaves, light green stems and a mild flavor. Cress, Cressida - Spicy pepper flavor. Fancy, three-lobed leaves. Dill - Dill-flavored, green feathery leaves. Fennel, Bronze - Mild fennel flavor. Bronze colored, thread-like leaves. Hon Tsai Tai - Mild radish flavor. Purple stems and green leaves with a purple tint. Kale, Red Russian - Mild flavor. Dark blue-green, serrated leaves outlined in pink. Komatsuna, Red - Mild flavor. Dark maroon leaves with bright green undersides. Magenta Spreen - Mild flavor. Magenta-"dusted" light green leaves and stems. Mizuna - Mild flavor. Fancy, toothed leaves. Mustard, Garnet Giant - Mildly spicy flavor. Darkest purple mustard. Pac Choi, Red Choi - Versatile Pac Choi adds a touch of red. Pea, Dwarf grey - Red blossoms for pea shoots and garnish. Purslane, Red Gruner - Mild, spinach-like flavor. Succulent green leaves and pink stems. Radish, Daikon - Crisp, spicy flavor. Green leaves and white stems. Radish, Hong Vit - Spicy flavor. Attractive pink stems and green leaves. Saltwort - Dark green leaves, medium green stems, and a mild, earthy flavor. Salad Burnet - Mild cucumber flavor. Green, uniquely shaped leaves. Scallion, Evergreen Hardy White - Onion flavored, green threads. Shungiku - Mild flavor. Aromatic, dark green, toothed leaves. Shiso, Britton - Mild licorice flavor. Silvery leaves with purple undersides. Sorrel, Red Veined - Lemon flavor. Dark green leaves with red veins and stems. slow. Tatsoi - Mild flavor. Spoon-shaped leaves. Tokyo Bekana - Mini Chinese cabbage for bunching or baby leaf. Yukini Savoy - Mini savoyed leaves. 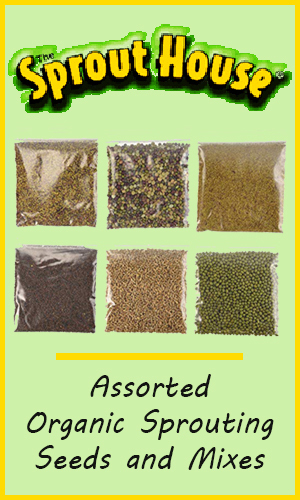 We also provide information on seed measurements, sprouting seeds and how to grow sprouts using different sprouting techniques.